Single Pilot & Two-Pilot Crews Available! We select only the most qualified, dedicated crewmembers to serve our clients. Shoreline flight crew members are screened and hand-selected by our staff of veteran aviators with emphasis placed on flight safety, customer service, and interpersonal interaction. Pilots are highly experienced and trained to proficiency, with in-house evaluations conducted personally by Shoreline's CEO, Captain Glen Rutland. 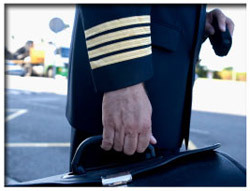 Our guarantee is that each pilot is a highly qualified aviation professional, and in many cases may be a former military or airline crew member. Pilots & crew members wishing to be considered for flight crew leasing placement should email us a current, comprehensive resume with a summary of flight experience. Interviews and crew placement are conducted on an as-needed basis and are subject to market demand and contract terms. For clients of all sizes, Shoreline Aviation Services can serve your professional flight crew staffing needs. Call Sara today at 1 (800) 747-0825 ext. #1 to discuss your flight crew staffing needs.